If you need a good double jogging stroller that provides optimum riding comfort to your kids then the BOB Revolution SE Duallie Stroller, is the double stroller for your family. 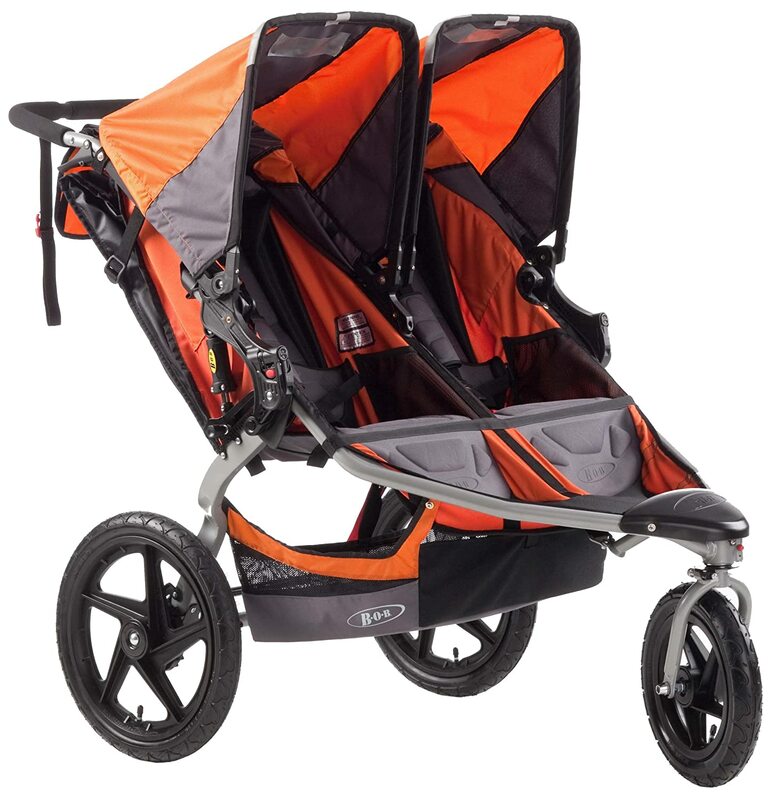 It may cost higher than other strollers but the great suspension system that acts as shock absorbers, the stability, and the over-all performance of the stroller will surely allow you to achieve your running goals, with your kids in tow. The materials used in manufacturing the stroller are heavy duty and top of the line to give you the peace of mind while jogging. The safety features are also at par, even higher with similar products in the market. More importantly it offers a smooth, comfortable ride for the children as the padded seats recline individually, and so do the canopies. The harnesses are likewise padded to offer superior comfort and safety to the children. It is also very convenient to use as a separate car seat adapter can be purchased for it to accommodate an infant car seat. It also has a two-step folding mechanism, making it easier for you to pack away and load in your car or on storage. Five-point padded harnessThe BOB Revolution SE Duallie Stroller has superior safety features that would rival even the highest priced double jogging strollers in the market. It comes with a five point harness system that ensures safety and comfort for the children. The front tires can be manually adjusted to lock into place to ensure stability while jogging. The back tires meanwhile are wide enough to withstand changes in the terrain, and it comes with foot breaks to if and when immediate breaking is needed. 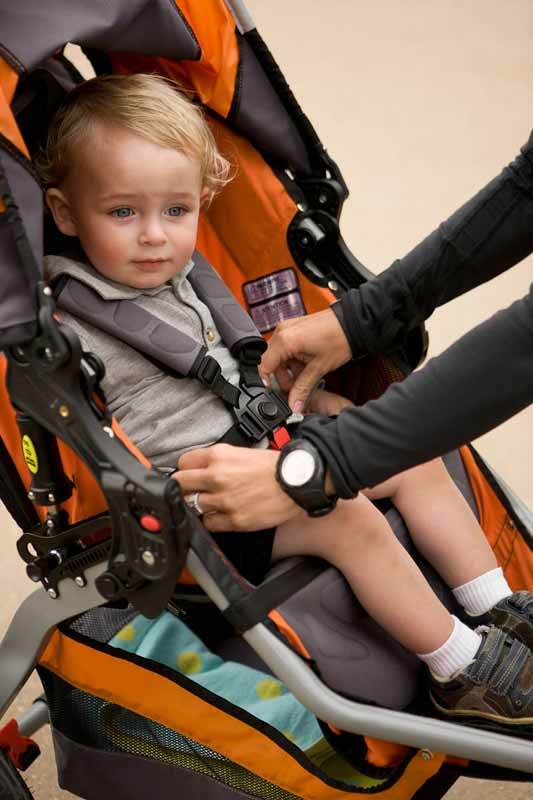 It also comes with a hand strap for the parent to ensure a safe ride while running at a quicker pace. One of the best features of this double jogging stroller is the optimum comfort that it provides to the children. It comes with a state-of-the-art suspension system that acts as shock absorbers and provides riding comfort to the kids even on an uneven terrain. It also comes with padded seats and harnesses to ensure a comfortable ride for the children. The seats recline individually as well, and the canopies can also be adjusted independent of each other. 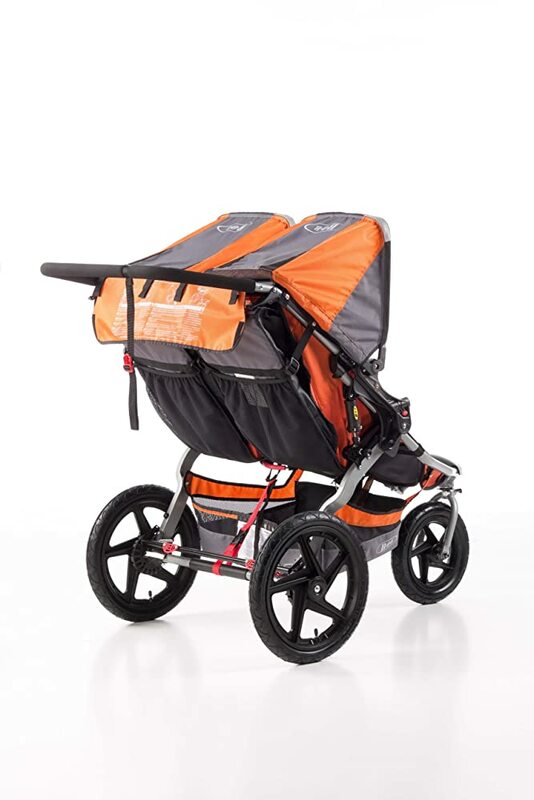 This jogging stroller provides for a very light and stable run as it comes with a swiveling front wheel that can be locked into place for a quicker pace, and can be unlocked for maximum maneuverability. 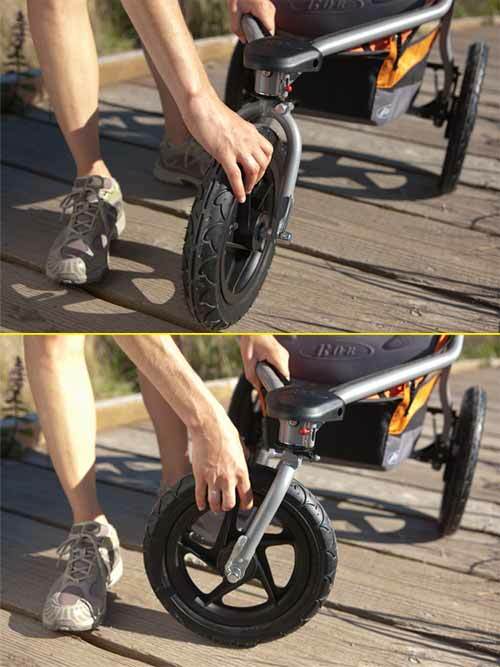 The handle bars are also great and easier to grip, and comes with a strap to ensure the kids’ safety during your jog. There are also large canopy windows so you can check on the children during your jog. This double stroller is easy to stow-away with its two-step folding mechanism. It also has a lot of storage options such as the back seat pockets and the under seat basket. A separate car seat adapter can also be purchased so you could fit your infant car seat. A snack tray can also be accommodated for older infants and children. The stroller is easy to clean as well, as the fabric surface of the stroller is stain-resistant. It can also fit most doors in public places. Great Ride: The top-of-the line suspension system and the high-quality and durable materials used in manufacturing the stroller provide for a very good and comfortable ride for the children. These shock absorbers mainly provide a stable comfort for the children despite changes in the terrain, or even while running through uneven roads. The seats are also padded, and so are the harnesses so even if the parent jogs on a quicker pace, the children remain cushioned in comfort. Best Outdoor Stroller: The seats can also be adjusted and reclined separately from the other, so there will be no fussing if one kid is snoozing. And the other child wants to look around. The canopies are also wide enough and can be fully adjusted to ensure the children’s protection from Sun rays or light rains. Stable Run: Its front tire comes with a swiveling mechanism that can lock into place for a more stable run. It is light and easy to push allowing you to easily adopt to a good jogging pace. The handle bars are comfortable enough to the grip whilst running. Lots of Storage Options: Unlike similar products in the market, this double jogging stroller comes with a lot of storage options which include: an under seat basket and back pockets, that provide maximum convenience to the parent. Higher Price Point: When compared to other double jogging strollers, the BOB Revolution SE Duallie Stroller is in the mid-to high price range. Not too great for indoors: It is wide, so even if it is easy to maneuver, it may be tight to fit into the doors of some shops, so it may be difficult to bring during shopping and leisurely walks in an indoor setting such as museum tours. Some parts need to be bought separately: You will need to buy the snack trays separately, and if you need to attach an infant car seat, the adaptor is sold separately as well. Not Manufactured in the USA: Most similar products (even higher priced ones) are made outside the USA and if this is an issue with you, then you may want to take note that this stroller is made in China. Bulky in terms of storage: It takes up too much space in the trunk of a car or a small SUV. If you a good double jogging stroller that provides optimum riding comfort to your kids then the BOB Revolution SE Duallie Stroller, is the double stroller for your family. If you are searching for a double jogging stroller that provides maximum comfort, durability, and best jogging experience the BOB Revolution SE Duallie Stroller is the best stroller for your family. You may have to pay more, but the optimum riding comfort brought about by the superior suspension system and padded seats and harnesses cushions the kids while you are running. The safety features of the stroller also put your mind at ease as you can run in a pace you like without the worries. It may be a bit bulky, but the bulk makes up for the convenient and comfortable ride for the children. It is worth every penny. 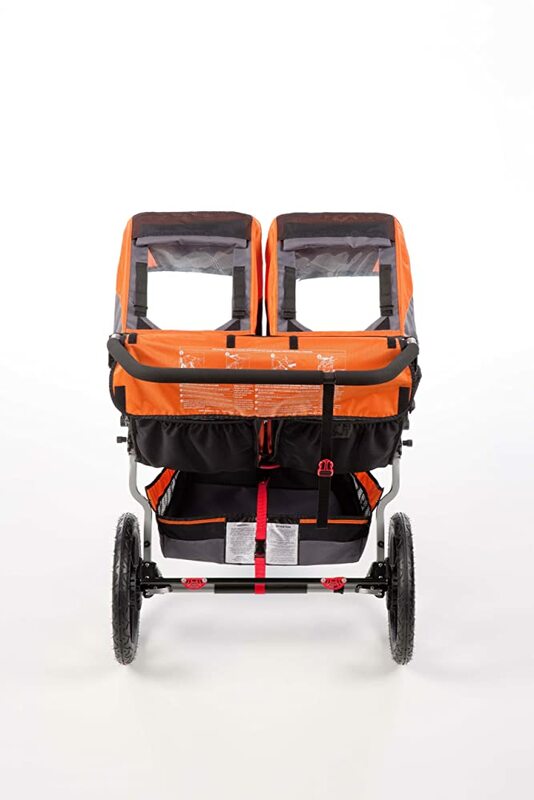 If you love the stroller be sure to wait and check this amazing double stroller too at here baby jogger city select double stroller.